The essential theme of the book is that the U.S. must dismantle its empire or face a future of poverty and strife within a divided nation. As these essays were written over a period of five years, there is some reiteration of information – particularly on the military bases and their costs and effects on the economy (not to mention all the other costs to the ‘host’ countries). Yet that only reinforces the significance of Johnson’s thesis, as the numbers are somewhat astounding for their significance with both foreign and domestic policy. As the title indicates, to save the U.S. as a democratic republic, the empire must be dismantled. Dismantling the Empire – America’s Last Best Hope. Chalmers Johnson. Metropolitan Books, Henry Holt and Company, NY. 2010. That the empire has caused much trouble and is in trouble itself has been well documented and well explained by many current authors. 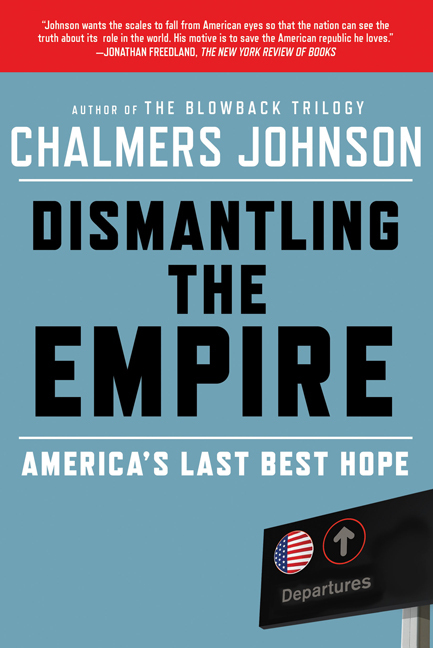 Chalmers Johnson, who wrote Blowback – at the time an unheralded piece of research – and two more volumes, Sorrows of Empire and Nemesis that became the Blowback trilogy, has since written a series of essays that are concise, clear, hard-hitting, and undeniably for Dismantling the Empire. The essential theme of the book is that the U.S. must dismantle its empire or face a future of poverty and strife within a divided nation. As these essays were written over a period of five years, there is some reiteration of information – particularly on the military bases and their costs and effects on the economy (not to mention all the other costs to the ‘host’ countries). Yet that only reinforces the significance of Johnson’s thesis, as the numbers are somewhat astounding for their significance with both foreign and domestic policy. As the title indicates, to save the U.S. as a democratic republic, the empire must be dismantled. If not…. 1) the CIA should be shut down. 2) the overseas military bases need to be dismantled. 3) economy – the pork-barrelling of politicians within the military-industrial complex also needs to be shut down. The third factor that is the basic one for all the arguments about the decline and fall of the empire is economic. This concern can be sub-texted in several ways: the costs of the mercenary armies; the pork-barrel economy of a Congress that “is no longer responsive to the people;” the military bases as introduced above; and the industrial economy based within the Pentagon. Johnson reiterates that the military economy of the U.S. is more than that of all the other world militaries combined, with many unknowns including the black hole of the unaccountable Pentagon. Another factor is the money used for the military is money not used for infrastructure of anything else like hospitals, transportation, education, or a social safety net, all of which would be much more highly beneficial to the people of the United States. It is impossible to know what ‘innovations’ would or would not have risen from technological knowledge, although previous histories would indicate that technology that has helped humans has operated more or less independently of the various imperial armies of the past. Money spent on the military – in spite of the pork-barrel politics that disperses the money around every state in many different industries from Lockheed Martin and Boeing to Kodak and Intel to garner leverage for votes in congress – does not help the economy, but hinders its growth. The corporate sector has become a “dominant partner with the state,” fulfilling the argument that fascism should be called corporatism “because it was a merger of state and corporate power.” Because “a corporation [is] less amenable to public or congressional scrutiny,” these relationships “afford the private sector an added measure of security from [public] scrutiny.” The main motive of big business is “to replace democratic institutions with those representing the interests of capital.” This latter point is obvious when the institutions of the ‘Washington consensus’ – the IMF, World Bank – and other more obvious corporate entities such as the WTO and the OECD are deciding many of the rules of international economic interaction. Johnson’s longer works provide ample evidence and arguments to back up his shorter essays (which are also well referenced). Dismantle the Empire is a must read for anyone looking for a quick, concise, and meaningful information concerning the future of the American Empire.